Product prices and availability are accurate as of 2019-04-19 13:38:28 UTC and are subject to change. Any price and availability information displayed on http://www.amazon.com/ at the time of purchase will apply to the purchase of this product. Deployments are hard on military couples. 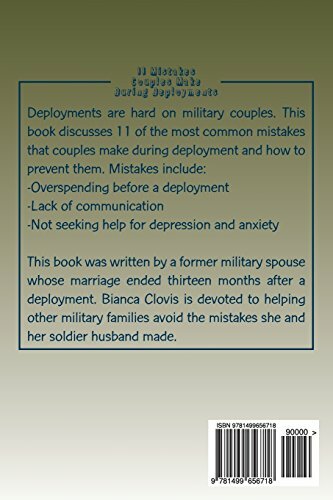 This book discusses 11 of the most common mistakes that couples make during deployment and how to prevent them. Mistakes include: -Overspending before a deployment -Lack of communication -Not seeking help for depression and anxiety This book is short but packed with valuable information. This book was written by a former military spouse whose marriage ended thirteen months after a deployment. Bianca Clovis is devoted to helping other military families avoid the mistakes she and her soldier husband made.